That is an easy transition of saree with a bohemian twist. This style will appeal to every girl who is a boho chic at heart. The style is quite easy to carry off as well. All you need is a trendy, modern saree. Georgette, net or other light-weight fabrics will be apt. The next thing you need is a dhoti pant and a crop top. There is no need to wear a petticoat in this style. 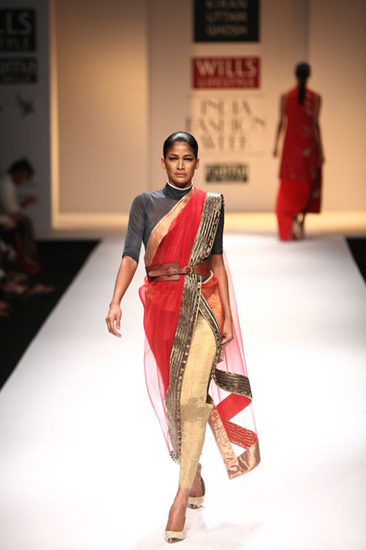 Simply drape the saree over your dhoti pant in a way that you make pleats and tuck them perfectly in the centre. You can either choose to cover the front bodice with pallu or wear a crop top over it. Either way, you will rock in a dhoti pant style saree. You can pick a sleek waist belt to accentuate it more. Remember the blue saree of Deepika Padukone from Yeh Jawani Hai Diwanithat made headlines. The sultry look of Deepika was channelled with an inverted drape style of saree. This saree style resembles the Mermaid drape but the only difference is that it is tied little below the usual waist to highlight the curves and drape get narrow at the bodice. The style is perfect to highlight your hourglass figure. Fancy a fusion saree look? Take out a ghagra from your trunk or buy one and simply layer a saree over it in a way that it looks like a lehenga saree but with a twist. You can adjust the pallu like a dupatta encircling around your waist and left shoulder to create the perfect fusion look. If you can’t pull off ethnic Indian wear, there is no need to be disappointed. You can still wear a saree by turning it into a structured dress just like the designers Abraham & Thakore did in a recent fashion show. All you need is a pair of matching leggings or fitted pants and drape a half-saree over it just like a skirt. Cover one shoulder with the pallu, pleats are optional, however. An easy-peasy saree dress is ready. Tie a metallic belt around the waist for extra style points. Crop tops are such a rage these days. The new trend is – they have replaced saree blouses. No need to wear embellished or heavy saree blouses in the similar pattern. Try something different by adding a crop-top twist to your saree. A black crop top will be a great investment as it will go with any saree. Drape the saree in your own style and go out with minimal accessories look. Nehru jackets are extremely versatile as they go perfectly with Indian as well as modern attire. You can choose to layer your saree over a Nehru jacket or vice versa. This style is the best to try out in winters. If you don’t want to wear it with Nehru jacket, you can replace it with a collared shirt look. This modern updo of saree will definitely catch many eyes. 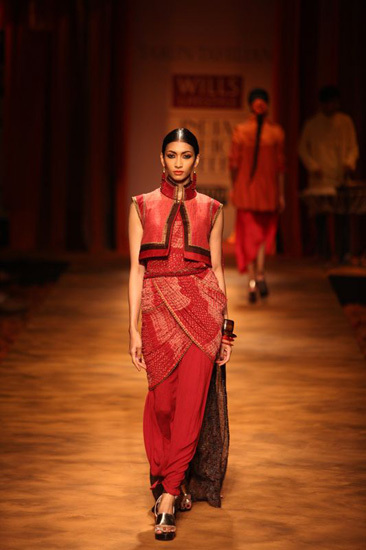 Blend in your modern ensemble with traditional saree with this style and complete it with a broad waist belt. You need a fitted and full skirt for this style to serve as a base for draping the saree. The turtle neck will up the style quotient further. 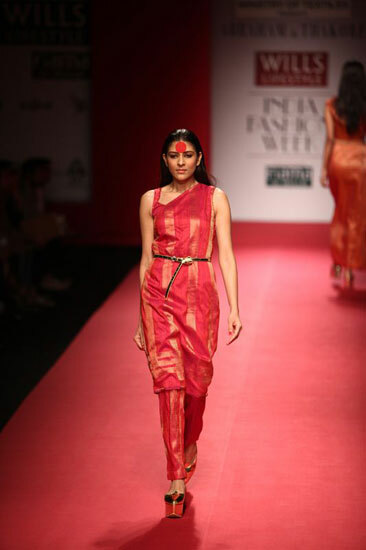 Drape the saree in the dhoti style and finish the look with a belt. The belt will keep the saree in place and lends you a slim, curvy look. We all are familiar with the typographic fashion trend in tees and tops. Sarees are no exception to that. You can find quirky sarees with typographic prints or blouses taking over the fashion world by storm. 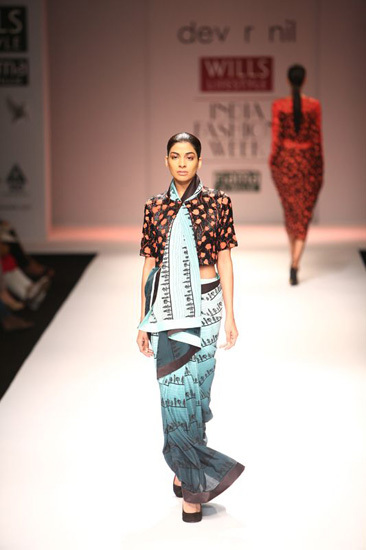 A typographic is a modern take on saree with a print that appeals to the modern Indian women. So this style is a must-try for all modern saree aficionados. The other thing you need is a cropped bolero jacket. Simply pair them together for the ultimate fusion saree look. To add a fancy twist, you can do the saree pallu differently by wrapping it like a scarf around the neck and bringit to the front. Keep the accessories to the minimum with this look. For the modern women who wants to adorn saree with no fuss, this style is perfect for them. A blouse is replaced with a bikini to reveal more but the balance is achieved by keeping the pallu in the open style with no pleats. The saree in this style is draped as usual but the catch is to keep the pallu flowy and non-pleated for a comfortable yet sassy look. Take cues from Priyanka’s saree in the famous Desi Girl song or the look of Kareena and Karishma Kapoor in this saree style.